A strong first quarter set the tone on Friday night for the Hamilton Tiger-Cats, who never looked back en route to a convincing 42-25 win over the visiting Ottawa REDBLACKS in the pre-season finale for both teams. The Ticats were buoyed by strong first-half performances from a trio of starters; quarterback Jeremiah Masoli put in a confident 9-for-15, 136-yard performance under centre, slotback Chad Owens terrorized the Ottawa secondary, and running back C.J. Gable looked sharp in limited reps.
Hamilton rushed out to a 7-0 lead courtesy of an efficient drive led by Masoli and Gable. After taking a Kendall Montgomery sack on the game’s first play from scrimmage, Masoli drove the Tiger-Cats into REDBLACKS territory, setting up a pair of Gable runs which took the Tabbies into the end zone. REDBLACKS starting quarterback Danny O’Brien threw an unlucky interception on just his third attempt of the night. O’Brien’s pass over the middle, intended for Travis Greene, bounced off the Ottawa running back’s hands and into those of Hamilton linebacker Rico Murray. Chris Milo drilled a 25-yard field goal later in the first quarter to get Ottawa on the board and cut his team’s deficit to 7-3. 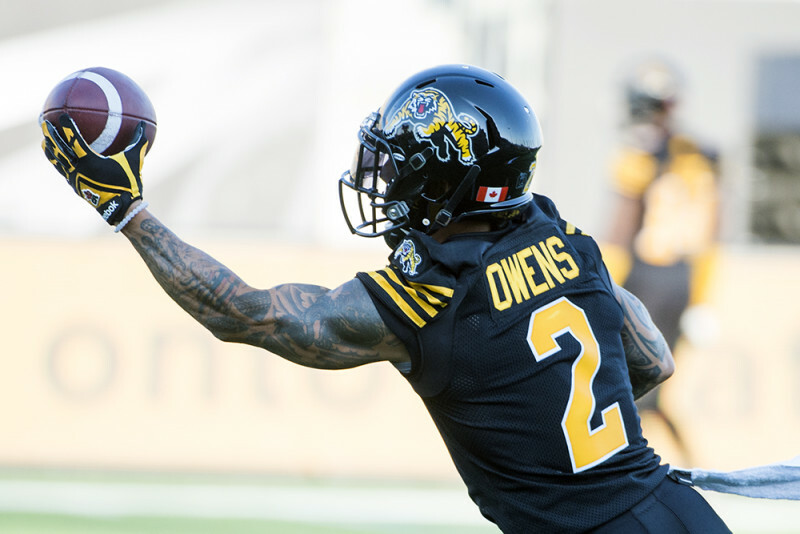 Masoli went right back to work on the ensuing drive, hooking up with Chad Owens twice — the second time in the end zone — for 66 yards and a touchdown to stretch the hosts’ lead to 14-3. Hamilton opened the second quarter with a statement play on special teams, as Quinton Pointer took a pitch on a third-down fake punt and motored 52 yards to the end zone. After Cody Mandell missed the PAT, the Ticats led 20-3. A couple of singles on a missed 49-yard field goal and a punt through the end zone for Cody Mandell then stretched Hamilton’s lead to 22-3. Hamilton closed out the second quarter the way it began with another special-teams touchdown. Capitalizing on a muffed punt by Ottawa return man Dior Mathis, Ticats defensive back Trey Wolfe swooped in, recovered the loose ball, took it to the house and celebrated in style with an end zone backflip. Mandell missed another PAT, and Hamilton’s lead sat at 28-3. A 43-yard Chris Milo field goal wrapped up the first-half scoring; Hamilton’s stars and special teams had staked them out to a comfortable lead on home turf against a young Ottawa squad. The game slowed down with substitutions en masse in the second half; the REDBLACKS picked up their first touchdown halfway through the third quarter on a 1-yard Travis Greene run, then Brent Maher nailed a 47-yard field goal for the Ticats, who led 31-14 after three quarters. 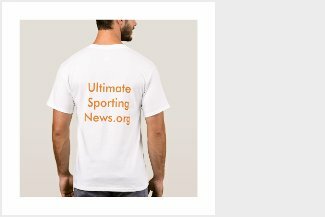 Backup quarterback Jeff Matthews began the fourth quarter by plunging in for a touchdown from the 1-yard line on the second play of the quarter. Maher hit the PAT to push Hamilton’s lead to 38-14. 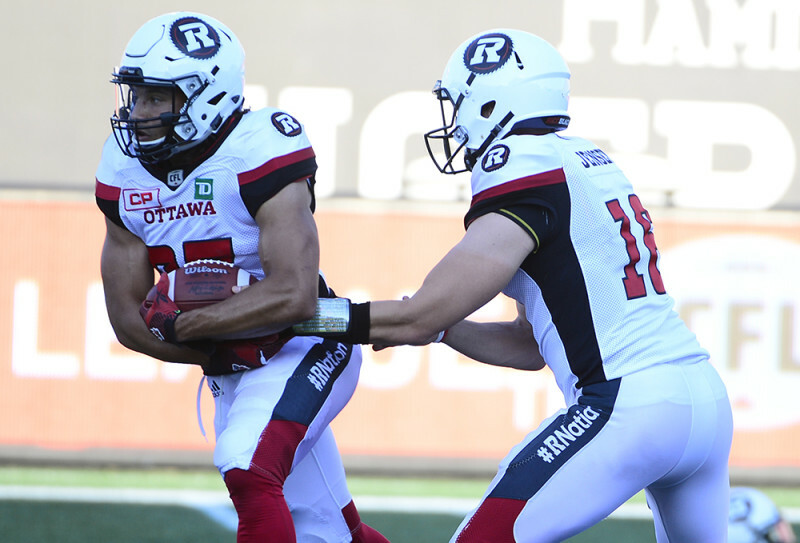 With all kinds of subs into the game in both uniforms and on both sides of the ball, REDBLACKS starting quarterback Danny O’Brien returned to the game, drove the length of the field, and finished off a tidy 11-play drive with a 13-yard touchdown run. Ottawa completed the ensuing two-point convert to cut its deficit to 38-22. Hamilton’s lead grew to 41-22 on a 44-yard field goal from Brett Maher, who later tallied a single on a 62-yard field goal attempt. Chris Milo added a late 26-yard field goal to round out the night’s scoring. Notable defensive performances for Hamilton included Travis Lee’s team-high six tackles and Jonathan Langa’s two interceptions. Doug Moss paced the REDBLACKS defence with five tackles. The battle between Danny O’Brien and Brock Jensen for the third-string quarterback job was a storyline for Ottawa entering Friday’s game. Neither truly shone in the defeat, nor did either look out of place; O’Brien was 17-of-20 for 151 yards and threw an interception, while Jensen was 13-of-21 for 146 yards and tossed two interceptions. The Ticats and REDBLACKS will both hit the road to open the 2016 CFL regular season; Hamilton will travel up the highway to Toronto and face the Argonauts at BMO Field on Thursday night (7:30 p.m. ET), while Ottawa will trek to Edmonton for a Saturday-night date with the Eskimos (7 p.m. ET).